Yik Yak, an app that acts like a local bulletin board, allowing users within a 1.5-mile range to post to it anonymously, hasn’t received nearly as much press as other anonymous apps, including Whisper and Secret. It’s seeing much more user pick-up, though. As of last night, Yik Yak was the 27th most downloaded free app in the U.S., right behind Twitter, according to app analytics company App Annie. It was also the sixth most downloaded social media app. Twitter was ranked fifth. The year-old, Atlanta-based company is almost exclusively a college-based phenomenon for now – and very much by design. Indeed, in August, Yik Yak hired 140 campus “representatives” to plaster universities with its marketing materials, a campaign that appears to have been very effective, though Yik Yak doesn’t disclose user numbers. The question is whether the app makes sense beyond college campuses. Yesterday, StrictlyVC talked with Cameron Lester of Azure Capital, one of the company’s backers, about it. Our conversation has been edited for length. You found Yik Yak early on. How? We found it through outbound research. Anyone who spends time with millennials can see their growing lack of interest in the traditional Facebook experience and gravitation to mobile social; as we were forming a thesis around [what’s next], Yik Yak appeared on our radar. We reached out to one of the company’s seed investors who we know and we ended up participating in its [$1.5 million] seed round. When the company was raising a more formal amount — its $10 million Series A, which came together quickly — DCM led the round and we participated in it, investing well above our pro rata. Yik Yak is taking off on college campuses. Why is that, and can it grow beyond universities, or is that a big enough market? The advantages to [a college body] are numerous. Yik Yak isn’t offensive relative to some other social media apps that include photos, because from an anonymity perspective, photos create a big problem. The fact that it’s location based, bringing together users in a 1.5-mile radius, also provides a lot of contextual value, particularly if you have a demographic in that range that has a lot of affinity like college students. Yik Yak also [plays into] a big backlash against this concept of [a trackable] online identity. People want the same level of privacy online that they enjoy offline. In the meantime, we’re already starting to see Yik Yak bleed out into other places. This summer, for example, when people got off campus, networks sprung up on Wall Street, with Goldman Sachs interns bantering with Merrill Lynch interns. The same thing happened on Capitol Hill, with Democratic and Republican interns. And in summer, the user base was a fraction of what it is today. 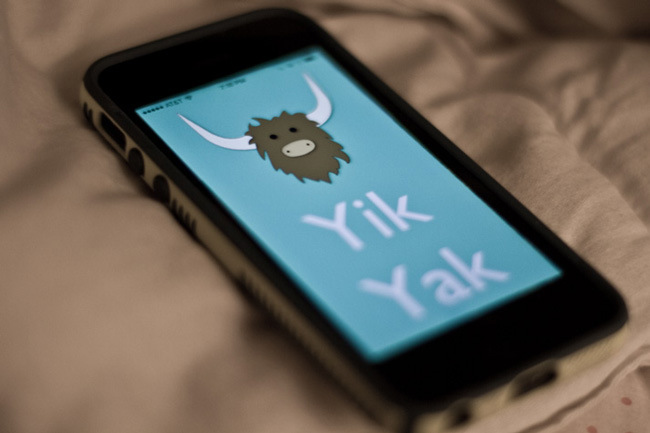 Yik Yak recently made it possible to peek into other Yik Yak feeds anywhere in the world. That would seem to have a lot of really interesting applications, including for journalists who right now rely heavily on Twitter for breaking news. Yes, you can now place a pointer on a map of the world and go to Moscow, Hong Kong, Dubai or elsewhere to see what’s going on. It’s pretty crazy. You can’t participate but you can see what’s happening. Basically, American college kids are [introducing it everywhere]. The company’s next phase of growth is urban areas around the globe. Step one is to get to critical mass. But Yik Yak is uniquely positioned to monetize around local affinity. We’re living in sharing economy and all kinds of local services would love access to this kind of user base. You can also imagine sponsorships, local advertising through a model like Sponsored Tweets . . . That the audience is especially local and can be segmented provides unique revenue opportunities. Yik Yak has already been involved in cases of bullying. To keep the app out of the hands of high school students, who began using it to abuse one another earlier this year, the company had to draw a geofence around nearly every high school and middle school in the country. Do you worry about the liabilities or risk to your brand? Back in the spring, I had two middle school students – one just went to high school – and all that [bullying] stuff [in high schools] was going down and my reaction was: No way. Then my son came home and said, “They told us about this app that we shouldn’t use.” Then I was really thinking: No. But these founders are white hat guys; they’ve wanted to build something big and useful and benign from the beginning, and they’ve been very proactive about getting bullying and any kind of comments that shouldn’t be there off the system. I think if anything, we’re on the back side of this. I feel like if there was a risk, that’s already been largely alleviated and what we have to do is more of the same.